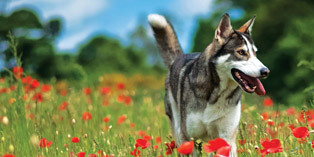 The Northern Inuit Society takes responsibility for every puppy it registers. In the sad event that a puppy needs re-homing if a breeder is unable to take the puppy back into their care, NIS Rescue will place the dog in foster care (at the NIS’ cost) until a permanent forever home can be found. Funding dogs in foster care can be very expensive, some dogs need extensive veterinary care and will need to be spayed/neutered, let alone the food bill! NIS Rescue is funded completely through the kind donations and sponsorship of our members and those wanting to help dogs in need. We are always looking for fundraising ideas so if you can help please get in touch. We often have dogs in need of fostering temporarily or looking for their forever homes – can you help? Want to know what is like to foster or adopt a Northern Inuit? Read Danuta’s Story by clicking here. This is Talo one of the older boys who has been re-homed through NIS Rescue and is now happily living out his life with a big pack of dogs and his fantastic owners. 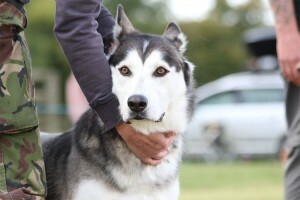 He is a regular on the Show circuit and has a great deal of rosettes and wins to his name. Read Danuta’s story to find out more. This is Xena who was re-homed through NIS Rescue several years ago, a happy girl who spends her days playing with two other northern inuits.